Chives (allium schoenoprasum) are a member of the allium family, a family that includes onions and garlic among its other more popular members and the more ornamentals alliums like the giant purple variety that look like huge purple lollipops when they bloom in May in my part of the country. Chives actually bloom as well, in a pretty sort of lavender pink. The blooms are edible and taste faintly onion-y. But long before the plants bloom, the long, grass-like blades of the plant (chives are actually a bulb, like all members of the allium family) are ready to harvest to add zest to salads, soups, stews and more. Chives, being bulbs, are perennial. Because they are bulbs, they are going to be a bit finicky about liking well-drained soil, although they seem to grow even for me in my heavy clay. Over time, they will increase in size, as will most perennial herbs. One of my favorite things to do with chives is to snip a few blades into fresh-made chicken salad. They are also great to add into cucumber salad–or your own favorite type of salad. 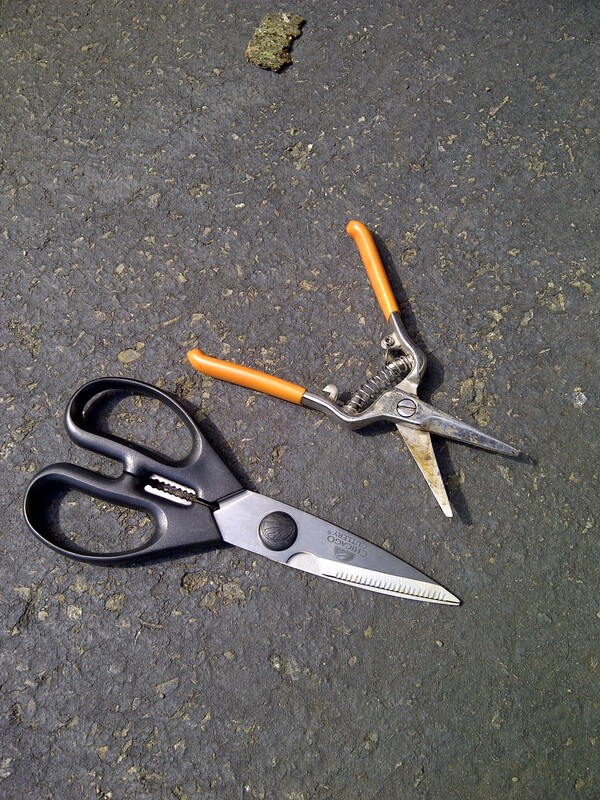 I keep a couple of types of implements available for my herbs–one for cutting them from the plants and another in the kitchen–a special kitchen shears just for herbs (so I don’t have to worry about what my other kitchen scissors might have been used for last!). But you needn’t be as persnickety as I am, particularly about harvesting. Another great thing about chives is that they will take a bit more shade than some of the other herbs. They are not what I will later call some of the “Mediterranean” herbs, that come from the region where it’s hot and dry so they really need that full sun all day long. Of course, as with all herbs, the more sun you can give them, the happier they’ll be. But mine get, at best, morning sun only. 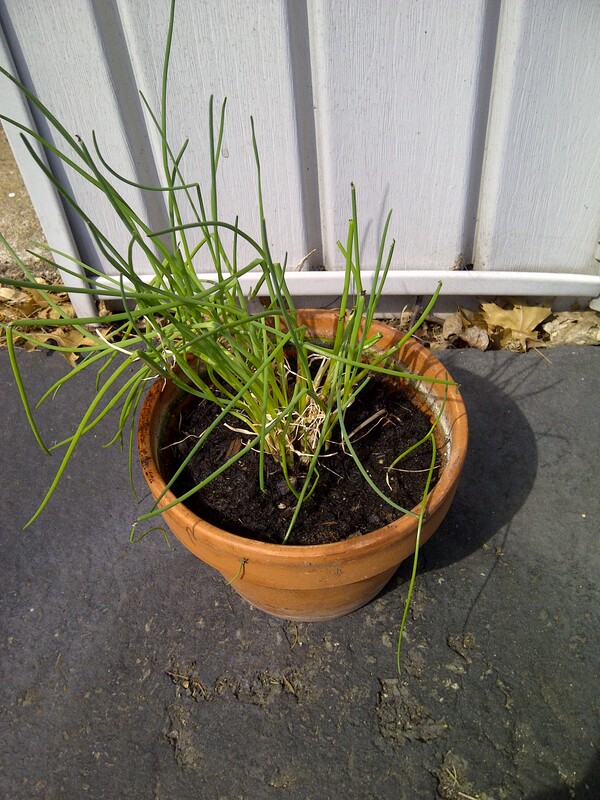 This pot of tiny bulbs wintered on my sun porch–in case I felt I just had to have some fresh chives over the winter. I also have a larger patch in the garden. Once you start adding fresh herbs to your food, it will be hard to go back and add the dried variety–even if you are fortunate enough to have a good spice store nearby. Fresh herbs have so much more flavor than the dried variety. And they are so easy to come by–they are in supermarkets, every garden center and even the box stores this time of year. Decide what your favorite herb is–go to your pantry right now and look at your cute little glass jars and decide. Then go get a plant and see how much better that same herb tastes when it’s grown fresh. I promise you won’t be disappointed.